• Vitamin D is present in certain fish and fortified foods such as cow’s milk, orange juice, and breakfast cereals. However, it is difficult to get adequate amounts of vitamin D through diet alone. • Due to insufficient exposure to sunlight, people who live farther from the equator have a greater risk of having insufficient vitamin D levels than those who live near it. • Even weak sunscreens (SPF 8) can inhibit vitamin D production by up to 95%. • The older you are, the more vitamin D you need. With age, your body becomes less efficient in converting vitamin D to a form it can use. • People with darker skin are more susceptible to having insufficient vitamin D levels. Are YOU getting enough Vitamin D? Get the answer with Vitamin D-ology™, a new online quiz developed by Shaklee Scientists. Based on the answers to 8 simple questions, the Vitamin D quiz will quickly calculate the Shaklee Health Sciences recommended level of Vitamin D. The level of vitamin D supplementation you may need depends on many factors including where you live, time of year, your skin color, how much sun exposure you get each day, your age, if you are overweight, how often you eat fish or vitamin D fortified foods and how often you exercise. 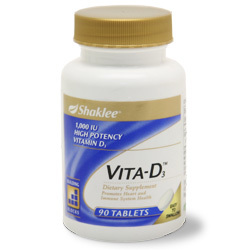 Who Should Consider Vita-D3? Men, women, and adolescents ages 16 and older who: * May not get adequate sun exposure * Don’t exercise regularly * May not get enough vitamin D from their diet * Are overweight * Live farther from the equator * Have darker skin pigmentation.